Children, from infancy through adolescence, now spend more time consuming media content than they do in school, with parents or engaging in any activity other than sleep. Parents, educators, and policy-makers are concerned, confused and overwhelmed, since the media we use and how we use them influence virtually every aspect of our lives. 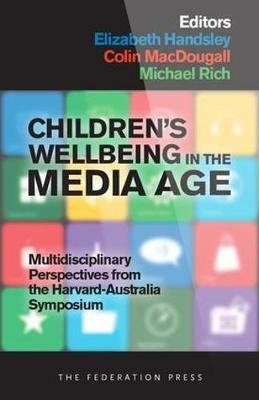 The Harvard-Australia Symposium on Media Use and Children's Wellbeing dared to tackle the problem as a whole by convening psychologists with specialties in child development, violence, advertising, body image and sleep; a human ecologist; a filmmaker; a couple of ethicists; a librarian; a social worker and a nutritionist to join a paediatrician, a lawyer and a public health researcher to address the question of how media use influences children's wellbeing. The project compared and contrasted disciplinary frameworks and methodologies used, and the strengths and limitations of each, to open up a conversation about how they might complement and synergise with each other. Participants expanded their horizons by breaking down the academic siloes and learning from one another. The discussion covered issues from sexualisation of children in the media, violent video games, social networking, food advertising, preschool television, the fashion industry and body image, to distressing content on the news. The Symposium acknowledged that media are so integrated into our lives that we cannot fully understand or effectively address the health and development of digital natives with anything but an multidisciplinary approach. The resulting conversation was fascinating and energising, engaging readers from any background to appreciate the differences, the commonalities and the ways in which these diverse perspectives complement each other to develop strategies for maximising the benefits and minimising the risks of media use.